One of the main reasons that business changes fail to achieve full benefit realization is that the change is "installed" but not "implemented"--the lights come on, the process is introduced, the new system is up and running--but there is not yet full adoption for the change. Download IMA's brand new, updated free Mini Guide to Installation vs. 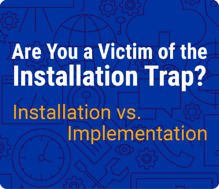 Implementation to see if your organization is falling into the Installation trap. Download the ALL NEW Updated Mini Guide Now!